One to five individual parts interlock to form a fluid-tight suction tube (Figure 9.5). Various modes of interlocking exist: Individual components can be interlocked by tongue and groove junctions, e.g., bees and flies (Figure 9.5A), or by a series of overlapping cuticle plates and hook-shaped structures, e.g., Lepidoptera (Figure 9.5B) [23,39,45]. When a single component forms the food canal (e.g., long-tongued pollen wasps), overlapping cuticle plates shape the food tube (Figure 9.5C) . In long-proboscid flies, the distal region of the food tube is formed by the strongly arched labium, the margins of which interlock to form the tube (Figure 9.5D) . In butterflies, epidermal gland cells in the galeal lumen may produce substances that help seal the linkage of the galeae (Figure 9.5B) . In long-tongued bees, the food canal is assembled anew each time the proboscis is extended for feeding (Figure 9.5D). During folding and extension, the components of the dipteran proboscis remain interlocked, but tongue and groove junctions permit sliding movements of the components against each other . The butterfly proboscis is assembled once during pupal emergence and remains permanently interlocked. In pupae, the two galeae develop separately and can only interlock by a distinct sequence of galeae movements following eclosion and prior to cuticular sclerotiza-tion. For nymphalid butterflies, interlocking of the galeae is an irreversible and indispensable process that occurs only once during a short time interval following eclosion . 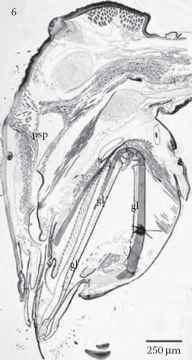 FIGURE 9.6 Sagittal section of the head of Ceramius hispanicus (Hymenoptera: Vespidae: Masarinae); pharyngeal suction pump (psp) enlargeable and contractable by pumping musculature; and glossa (gl) in retracted position inside the labium. 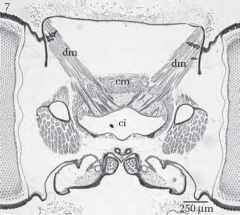 FIGURE 9.7 Cross section of the head of Heliconius melpomene (Lepidoptera: Nympha-lidae); large dilator muscles (dm) can expand the cibarial suction pump; and circular musculature (cm) can compress the cibarium (ci) for swallowing (images with permission of S. Eberhard).